Local company PT Pindad (Hall D, Stand 061) has teamed with CMI Defence of Belgium to develop the Badak (6×6) direct fire platform to meet the potential future operational requirements of the Indonesian Army. 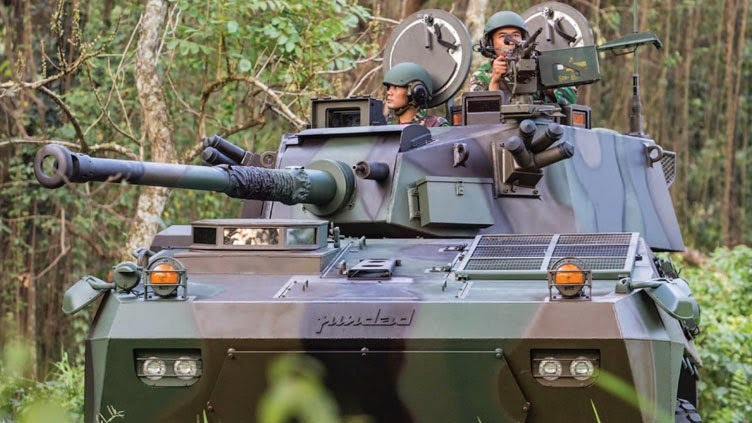 Badak features a new design all-welded monocoque steel hull that leverages from the current production Anoa (6×6) armoured personnel carrier (APC), of which more than 100 have now been built for Indonesia. The layout differs from that of the Anoa APC, with the power pack located front left and the driver seated towards the front on the right side, leaving the remainder of the hull clear for the installation of the turret. The powerpack consists of a 340hp diesel engine coupled to an automatic transmission, giving a maximum road speed of 90km/h. The steel armour hull provides protection up to STANAG 4569 Level 3, which is against attack from 12.7mm machine gun fire. The vehicle is fitted with double wishbone suspension to provide for increased mobility and improved stability when engaging targets. Direct firepower is provided by the installation of the CMI Defence CSE 90LP two-person turret, which has been produced in large quantities and can be fitted with various types of fire control system. This is armed with a CMI Defence 90mm low-pressure rifled gun, which can fire a wide range of ammunition. In addition, there is a 7.62mm co-axial machine gun, with another 7.62mm machine gun mounted on the left side of the turret roof for use in the self-defence and air defence roles, plus banks of 76mm grenade launchers. The baseline turret is provided with protection to STANAG 4569 Level 1, but can be upgraded to Level 4 if required by the customer. The 10th China International Aviation & Aerospace Exhibition to be unveiled on November 11, 2014 in Zhuhai of south China’s Guangdong province may witness the debut of two new models of domestically-made fighters, said Zhou Lewei, head of the Zhuhai Conference and Exhibition Bureau. The most possible models may be two of the J-10B, J-15 or J-16, according to Zhou Lewei. J-10B is a reasonable guess, because it is said to have entered mass production and made frequent appearance. It has been coded to 130, so it is mostly likely to show at the exhibition. J-10B adopts updated airborne devices, including AESA, HMDS, IRST, etc. After more advanced power systems are mounted, the fighter will become one of the most advanced warplanes in the world. J-15, nicknamed “Fei Sha” (Flying Shark) in Chinese, is improved from the 4th-generation fighter. Although it hasn’t made an official debut, it has been made public for multiple times and there is no surprise for it to show at the Zhuhai exhibition. J-15, with foldable wings, looks very similar to that of Russia-made Su-33. J-15 integrates the technology of J-11B. J-15 is equipped with two high-power engines and foldable wings. It has newly-designed high-lift devices, landing gears and arrester hooks, which help the warplane to land on carriers while maintaining outstanding operational performance. J-16, a new model of 3.5th-generation multi-functional dual-seat warplane evolved from J-11, uses Russian Su-30 fighter for reference. J-16 is equipped with AESA and can attack multiple targets at the same time and recognize the information about the targets. The biggest feature of J-16 is its long-range and Beyond Visual Range (BVR) strike capability and its strong air-to-ground and air-to-sea strike capability. In May 2014, the new batch of J-16 fighters was delivered to the Air Force of the Chinese People’s Liberation Army (PLAAF) and it is well-reasoned for it to show up in Zhuhai. US military officers are still unsure if the F-35 fighter will be cleared to make its debut at a British air show next week, a potentially damaging setback for the costly program. The Joint Strike Fighter has been touted as a technical marvel but the fleet remains grounded as authorities investigate what caused an engine fire last month for one of the aircraft, the Pentagon said on Tuesday. Officials had viewed the July 14-20 Farnborough International Air Show as a promising opportunity to show off the new plane before a global audience in Britain — a country that has invested heavily in the project. But the coming-out party may be called off over safety concerns, officials said. “There has not been a decision made on that yet,” Pentagon spokesman Rear Admiral John Kirby told reporters when asked whether the plane would fly at the event as planned. “I think certainly we’d be disappointed if we weren’t able to take it to Farnborough. Four F-35Bs, the vertical take-off version designed for the US Marine Corps, were supposed to feature in the air show, including one aircraft belonging to Britain that is undergoing tests in the United States. Both the US Air Force and Navy last week ordered a halt to all F-35 flights following the June 23 engine fire to allow for inspections of all the aircraft. The blaze broke out at the rear of the plane on the runway during takeoff at Eglin Air Force Base in Florida, according to the Air Force. The pilot managed to exit the jet safely and the fire was put out, but officials have yet to say what exactly triggered the problem. The incident raised fresh questions about the F-35 program and whether it can deliver as a game-changing stealth fighter. The most expensive weapons project in US history has been plagued by repeated delays and cost overruns. The program’s costs have swelled to nearly $400 billion for more than 2,000 aircraft, with each plane costing $160 million. The engine fire came just as the program appeared to be gaining a more solid footing, with officials pointing to progress in keeping costs under control and staying on schedule. Kirby said military leaders had full confidence in the aircraft and that Defense Secretary Chuck Hagel was due to pay a visit on Thursday to the Eglin base where the engine fire took place. “The secretary’s visit particularly at this time sends a strong message to our international partners that the United States remains fully committed to the F-35 program,” he said. Defense officials told AFP it was possible that three of the four planes could take part at Farnborough toward the end of the show, if aviation authorities conclude there is no serious risk to safety. “There’s still some time to make a decision,” said an official who spoke on condition of anonymity. Officials had originally planned for the F-35B aircraft to participate this weekend in a military aviation display, the Royal International Air Tattoo, but it was unclear if authorities would be ready to take a decision in time. British military aviation rules are stricter than US regulations and it is looking increasingly unlikely that the British-owned F-35B — now at Eglin in Florida — would make the trip across the Atlantic Ocean, officials said. The F-35 Lightning II Helmet Mounted Display System (HMDS) will make its CANSEC debut this year in the Rockwell Collins exhibit (Booth 1103). The HMDS, manufactured by Rockwell Collins ESA Vision Systems, provides F-35 pilots with unprecedented situational awareness for piloting the most advanced aircraft in the world. The virtual head up display provides pilots with day and night operation capability and a binocular wide field of view. Rockwell Collins is committed to serving its Canadian customers. With a workforce of more than 140 engineers, program managers and support staff in Ontario and Quebec, Rockwell Collins has a well-established and growing presence in Canada and is actively involved in the local communities. The Montreal facility primarily handles Commercial Systems sales to the Canadian civil aviation community. It is an important element in the company’s strategic alliance with Bombardier Aerospace, through which Rockwell Collins provides customer engineering and operations support. The facility in Ottawa specializes in the design and development of wireless, ad hoc networking technologies, including battlefield modeling and simulation of tactical networks. The SubNet Relay Technology developed there is in use with customers worldwide, deployed with some of the world’s major navies. Additionally, the Canadian-designed Tactical Application and Communication Test Bed enables customers to simulate operational military scenarios using models of military applications, devices and protocols through a fully distributed discrete event communication simulator. The facility also serves to coordinate customer service and repairs for Rockwell Collins products sold to Canadian military and commercial customers including Intermediate-level repair and service capability for the Multifunctional Information Distribution System (MIDS) Link 16 terminals installed on Canadian Forces’ CF-18 fighters and ARC-210 radios in use on all RCAF fleets of aircraft. Rockwell Collins is a pioneer in the development and deployment of innovative communication and aviation electronic solutions for both commercial and government applications. Our expertise in flight deck avionics, cabin electronics, mission communications, simulation and training, and information management is delivered by a global workforce, and a service and support network that crosses more than 150 countries. An advanced fighter concept (AFC) model launched by the Aviation Industry Corporation of China (AVIC) made its debut at the 15th Beijing Aviation Exhibition unveiled yesterday at the China National Convention Center in Beijing. In the series of fighters developed by AVIC, the AFC model, which made its debut at the Beijing Aviation Exhibition, is a multi-purpose advanced fighter designed to meet the demand of this kind of fighter in the future international arms trading, according to sources. The fighter adopts the design of single seat, double engines, twin vertical tails and normal layout with such features as high stealth performance, low cost, large bomb load, large combat radius and perfect integration of systems. In terms of the comprehensive combat effectiveness, China’s advanced fighter is superior to the 3.5-generation fighter and the modified third-generation fighter, basically equivalent to the typical fourth-generation fighters. The Supacat LRV 400 unveiled today at DSEI 2013 is a militarized variant of Qt Services’ successful `Wildcat` off-road motorsport vehicle, which has a proven record on the Rally Raid circuit and has earned a reputation for rugged reliability and high speeds over rough terrain. Supacat is launching the Light Reconnaissance Vehicle 400 (LRV 400) at the DSEi 2013 exhibition opened in London today. The vehicle is designed as a low cost, high performance capability for special forces, border patrol, reconnaissance, rapid intervention and light strike roles. Offering light forces supreme levels of all-terrain mobility, the LRV 400 is able to be tactically loaded within a CH-47 Chinook with its full operational payload on board. The LRV 400 is a militarized variant of Qt Services’ successful `Wildcat` off-road motorsport vehicle, which has a proven record on the Rally Raid circuit and has earned a reputation for rugged reliability and high speeds over rough terrain. Using a fresh approach, Supacat have teamed with Qt to modify and integrate the COTS vehicle to military standards, thus providing an affordable capability using proven technology. The LRV 400 fills the gap in Supacat’s product portfolio between the heavier `Jackal` surveillance, reconnaissance and patrol vehicle and the smaller All-Terrain Mobility Platform (ATMP). “The LRV 400 meets the gap in the military market for a light reconnaissance vehicle with an overall capability as close to that of Jackal as possible, but smaller and at less cost by adopting a COTS approach. 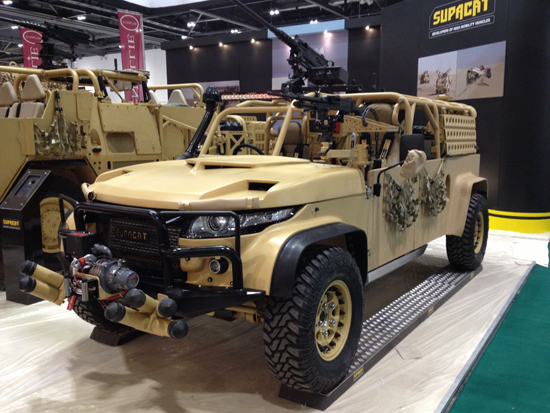 We’ve taken motorsports’ best of breed in Qt’s Wildcat and modified it to military specification using Supacat’s proven expertise in developing Jackal,” said Jamie Clarke, Head of Marketing & Communications, Supacat. “Supreme performance and tactical CH-47 internal loading have been key targets on this project. The users will be able to drive in and drive out without the need to offload their payload or to conduct any lengthy preparation for flight. When they get there, they will be afforded the very best terrain access and operational capability. Applying motorsport technology to Defence applications is an exciting approach and one that will deliver unrivalled performance”. The LRV 400 has evolved out of customer feedback on a proof-of-concept closed cab demonstrator developed by Supacat and Qt in 2011. Wildcat’s tubular space-frame chassis and state of the art suspension are critical to the LRV’s performance and rugged reliability. The display vehicle at DSEi is shown in a three crew configuration of commander, driver and gunner but the flexibility of the space-frame design allows the LRV 400 to be easily re-configured to meet different operational roles. With a Gross Vehicle Weight of 3500kg, a width of 1.8m and a height of 1.8m (weapon removed or lowered) the LRV 400 is easily air portable in a CH-47 Chinook helicopter. It boasts a maximum speed of 106 mph (170km/h) and a range of 1000km. Payload is up to 1400 kg, depending on customer specification and configuration. It can be fitted with a range of powertrain options – the display vehicle has a Ford 3.2-litre, 5-cylinder diesel engine developing 236 hp and 550 Nm torque coupled to a Ford-supplied 6-speed automatic gearbox and two-speed transfer box however, other engine and transmission options are available. In its first operational test with maritime operations, nine 47th Fighter Squadron A-10 Thunderbolt II pilots are debuting new helmet and survival radio technologies during the Rim of the Pacific exercise here June 29 through Aug. 3. One of the new technologies is the Scorpion system, which is integrated into the pilot’s current helmet, said Lt. Col. Tom McNurlin of the Air National Guard and Air Force Reserve Command Test Center in Tucson, Ariz. According to McNurlin, the new helmet system takes all the information in the aircraft and positions it on the ground so that each pilot can look at a heads-up display and know exactly where the targets are positioned on the ground without ever losing visual contact of these targets. McNurlin and two other pilots from the test center and one from the 53rd Wing at Eglin Air Force Base, Fla., are overseeing the operations during RIMPAC, which is the first time the technology has been tested during a large-scale maritime operation. The 47th Fighter Squadron was tasked with the testing of the system due to the fact that they were going to be involved in RIMPAC, and the system needed to be tested in a fully operational environment. Prior to coming to the exercise, McNurlin and his team visited the 47th FS at Barksdale Air Force Base, La., to familiarize the pilots and life support with the system, said Tech. Sgt. Arnold Davis, a technician with the 47th FS life support. The team spent a week working with the unit to learn the nuances of this helmet compared to the current one. The changes seemed straight forward when it came to modifying the existing equipment, said Davis. The designers of the Scorpion system allowed their modifications to go with what is already installed on the helmet. In addition to Scorpion, another technology was also tested during RIMPAC: the Lightweight Airborne Recovery System, known as LARS. According to McNurlin, the system is an advanced radio communication system that interfaces with the fielded Air Force search and rescue radios and is compatible with the current survival radio A-10 pilots carry. “We hit a button, it interrogates the radio, responds to us and we know exactly where they are,” McNurlin explained on how the system works in aiding in search and rescue of downed pilots. Both the Scorpion and LARS interface through the Suite 7B Operational Flight Program, which is the software that pulls it all together. The total system began development in 2010 and is scheduled to begin fielding in October of this year. The installation of this system has been a requirement for the aircraft for some time, and this requirement will finally become a reality when the systems are installed across the Air Force’s fleet of A-10s within 12 to 18 months, said McNurlin. Once started, each installation will take approximately three weeks and will take place at the Aircraft Maintenance and Regeneration Group at Davis-Monthan Air Force Base, Ariz.
As for the testing at RIMPAC, it has been a great opportunity and success for the test center, said McNurlin. “The fusion between the test and the operational world has gone well. “I think it is an incredible new capability,” added Sandifer. Twenty-two nations, more than 40 ships and submarines, more than 200 aircraft and 25,000 personnel are participating in RIMPAC exercise from June 29 to Aug. 3, in and around the Hawaiian Islands. The world’s largest international maritime exercise, RIMPAC provides a unique training opportunity that helps participants foster and sustain the cooperative relationships that are critical to ensuring the safety of sea lanes and security on the world’s oceans. RIMPAC 2012 is the 23rd exercise in the series that began in 1971.